It's not every day that you see a new game release for an old console, but it does happen from time to time. Though these releases will typically launch on a modern digital storefront simultaneously with the physical cartridge, it's still a great way to make a new game as retro as it can possibly get. 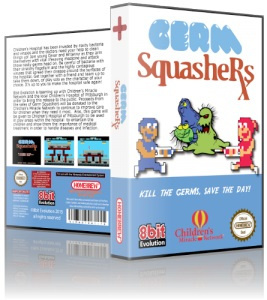 The next new NES game, Germ Squashers, has recently been announced, and best of all, the proceeds will be going to a good cause. Germ Squashers is an arcade action title that sees one or two players fighting off germs and utilising vaccination-themed power ups to gain an edge. The game will be releasing on NES, SNES, Genesis, iOS, and Android, with all proceeds going towards the Children's Miracle Network, a non-profit that raises funds for children's hospitals and medical research. Additionally, a 'Pittsburgh Retro Gaming Convention' will be held on the 23rd to promote retro gaming goodness and to raise more funds for the Children's Hospital of Pittsburgh. What do you think? Will you be picking up one of the versions of this new retro game? Share your thoughts in the comments below. That's awesome. Retro gaming for a good cause. What's not to like? As a cashier, I raised over four hundred dollars for the Children's Miracle Network last year, and I donate when I can myself. Does anybody know when this is coming out, and where I can buy it online? @KnightRider666 The source link has a signup where you put down your email and they'll "tell you when it's ready". I'd imagine that it launches some time in the near future, but there's no way to really tell. The guys who are making this, 8 Bit Evolution, are awesome! They actually just signed up yesterday to return to Super Smash Con this year, hopefully they can show off the game at their booth. You guys better review this! Even twice in this news. Need a review. There are tons of ways to give your money away for people claiming to cure cancer or what not. If I was gonna do this, the game needs to be good. How cool is it to see a brand-new NES game coming out now? Will be neat to see how it does however. So this is a ripoff of that scene in the Spongebob Alantis special? This looks cool I hope if turns out well. As someone who benefited from the work of the Children's Miracle Network, this is awesome! I will absolutely be picking at least one of these up! Like any game if it's good I'll get it, it's always fun to get new nes games. Will it be region locked? Lol. Great idea, I donate here to Irish charities when I can, wish some of them here would do something awesome like this along with an iOS and Android version too.